Most Oxford TRIZ work is guiding corporate teams to solve their own problems using their experience. Our unique TRIZ worksheets were developed to ensure when learning or applying TRIZ everyone joins in and contributes. This makes our TRIZ learning an enjoyable yet challenging and participative experience that will broaden participants' outlook and encourage pragmatic but creative and innovative outcomes. Most people describe our workshops as lively, unusual, fast paced and fun - which keeps everyone engaged, interested, and open to new directions. 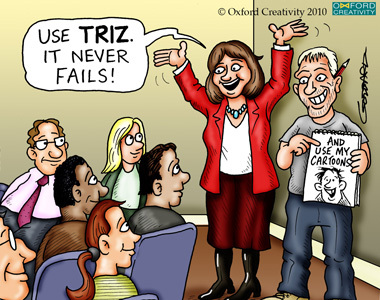 For individuals, TRIZ is very useful afterwards on a daily basis, and additionally uniquely powerful for problem solving in teams. Participants are people and they benefit from our memorable, clear, commissioned cartoon-laden communication delivered effectively to encourage positive thinking. 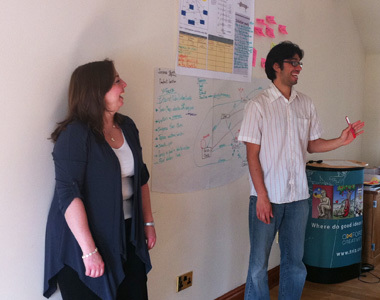 Our training courses and problem solving days are fast-paced, and enjoyable hard work. Most engineers, R&D specialists and innovation managers appreciate and expect this. We make all sessions lively and productive by good preparation and careful planning. Afterwards, we provide succinct conclusions and an audit trail of the debates and contributions. We ensure that your TRIZ journey takes you step-by-step from a ‘problem mess’ to a clearly understood and well defined problem list, leading to the strongest solutions available. We succeed well with groups with contradictions between stakeholders. We help you find solutions which can give everybody everything that they want. We work hard and know how to plan each session to keep workshops effective and fast so we can guide you solve your own problems. Every workshop’s forward planning includes consultation to create a detailed agenda, pre-printed materials, the right worksheets, to lead to the best routes to solutions. We enable organisations to engage all their people together for maximum participation to understand and resolve challenges together. Oxford TRIZ worksheets replace verbal arguments with problem solving journeys which combine everyone’s knowledge, experience and opinions with relevant solution triggers for fast results. 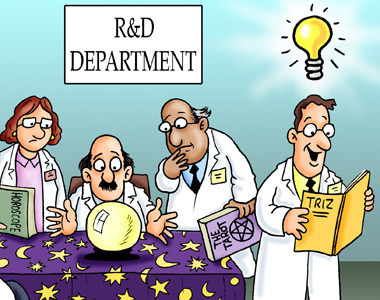 We do not use any TRIZ software for solving problems (as it gets in the way of the clarity of thought needed for TRIZ problem solving in teams). We endeavour to get the most out of people, guiding individuals and teams to find the answers they need. We never solve problems for clients - the groups we coach are the people who deliver their own clever, innovative and impressive results. We help your teams locate the strongest solutions no matter how long the issue was previously unresolved. There is no getting stuck with TRIZ, plus clear routes to carcking different problems again. Because we're not only interested in only getting results to the problem in hand, but also in the participants' understanding, and being able to replicate the process again - when we’re not there.